We are ready for spring at GSIB! Take a tour through our store to see what's new! Better yet, come see it in person! It's looking so cheery and welcoming! Welcome to Gone Scrappin' In Bloom! Aka GSIB! Here you will discover fun workshops & events, shop for fresh flowers, scrapbooking & art supplies, Manitoba made gifts and home décor or sit and enjoy fresh homemade food and drinks in our café! More than just an old heritage country store, it is a gathering place for friends to meet, inspiring workshops and toe tapping concerts. Come discover a destination that is more than you can imagine! Filled with vintage finds, unique products, good food and friendly faces! 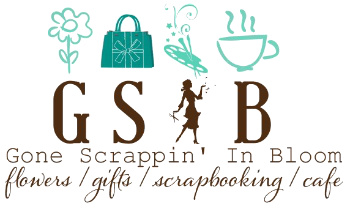 Welcome to Gone Scrappin' In Bloom - aka GSIB! It's nice to meet you, I'm Kelly Hunter! This has been my baby for over 10 years! Here you will find all of my passions rolled into a super amazing store and gathering space! My passions include my camera, scrapbooking, designing on my computer, a good book, a great cup of coffee, vintage treasures, art & music and the spa! So a lot of products that work their way onto GSIB shelves originate with some of my passions! With a crafty and artistic background, my first priority is supporting fellow artisans. Whether they be made locally, within Manitoba, Canada and beyond! You will find so many handmade and small batch crafted items in our shop or used within our café. GSIB is more than a physical place - it is a place of inspiration. I walk in and it reminds me - "this is why I did it". If these old brick walls and pickle barrel stained wood floors could talk. This building has been standing for over 80 years and it is full of good vibes! It re-charges your soul and calms! Take a breath and enjoy the slower pace as you walk in through the front door. When I need to re-charge or get away from the chaos of the Hunter house - you can find me at the store having a latte! Come and join me on our red couch! Welcome! It's Home for the Holidays at Gone Scrappin' In Bloom (aka GSIB)! A 1939 heritage general store in Rossburn, Manitoba. Each year we completely transform this old building into a magical Christmas emporium. Gone Scrappin' In Bloom features fresh flowers, scrapbooking supplies, gifts/home decor, many local & Manitoba made products and specialty cafe! Located between Asessippi Ski Resort & Clear Lake near Riding Mountain National Park on Highway 45! Definitely worth the road trip! Come explore, shop, sip a latte and take a break from the chaos of life. Road trips are the equivalent of human wings. Ask me to go on one, anywhere. We'll stop in every small town, learn the history and stories, feel the ground and capture the spirit. Then we'll turn it into our own story that will live inside our memories to always carry with us. Because stories are more important than things. Our menu changes daily. Fresh. Made to order with a warm cozy style and local twist. Manitoba roasted coffee, homemade daily soup, house baked goodies and more. Gather. Savour. Enjoy! Explore our galleries of past fresh floral designs! Designed with love and flair, we have something for every occasion and budget. The latest scrapbooking supplies! Mixed Media/Art Supplies. Planners & Accessories. Kids Books/Activity Kits/Crafts. Workshops for all ages! Discover local & Manitoba handcrafted wares! Eclectic vintage treasures! Gourmet Food Products! Home Decor & More! Information on our upcoming Home Routes Concerts! Upcoming classes and workshops. We host Adults & Children's Classes. More dates always being added. Check back often! All inclusive fun weekend events. Eat. Craft. Be Merry! Watch for upcoming dates! Held annually on the Saturday of May long weekend. This year it is May 19, 2018 at the Rossburn Town Hall. 2 floors of vendors + Outdoor Vendors and an old hall filled with antiques and hand crafted items = tons of fun! Click here vendors to apply! Hello! Keep up to date on all of our events, workshops and news happening at the store! Subscribe to our monthly newsbud and never miss a concert night or sale again! Plus we like to show a look into what's happening in our daily GSIB life and travels!